Dr. Dalbey received his B.S. degree in chemistry from University of Washington in 1978 and his Ph.D. in Biochemistry from Washington State University in 1983. That same year he joined the laboratory of Professor William Wickner at UCLA as a NIH postdoctoral fellow. Then he moved from the West coast to the Midwest to become a member of the faculty at The Ohio State University in 1987. He was promoted to Full Professor in 1999. 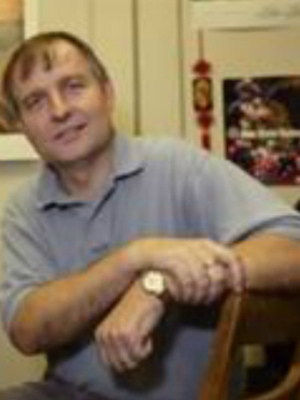 Professor Dalbey won a Junior Faculty Award (1989-1992) from the American Cancer Society. In 1996, he was a visiting professor at the Federal Institute of Technology in Lausanne, Switzerland working with Professor Horst Vogel. Dr. Dalbey is a member of the American Chemical Society, Federation of American Societies for Experimental Biology, Sigma Xi, American Society of Microbiology, and the honor Society of Phi Kappa Phi. He is an elected fellow of the AAAS. Our lab’s central interest is the determination of how proteins are transported and inserted into membrane to obtain their proper structure. We are employing biochemical and in vivo approaches to understand membrane protein assembly. We have identified a novel protein, YidC that specializes in membrane protein topogenesis. The general relevance of this finding is underscored by the homology of YidC to the mitochondrial Oxa1, which functions in a novel pathway for insertion of inner membrane proteins from the mitochondrial matrix compartment. The goal now is to determine the substrate specificity of YidC, to determine the function of YidC in the integration and folding of multispanning membrane proteins, define the structural features of YidC and the insertion pore of the YidC dimer. Another serious interest here is the study of proteases involved in the cleavage of proteins and peptides that are transiently associated with cellular membranes. These proteases such as signal peptidase and signal peptide peptidases are crucially important for a wide range of essential biological processes. We are very interested in how the cell meets the “chemical challenge” of peptide bond hydrolysis in proteins that are shielded by non-aqueous environments. Recent graduates from the Dalbey lab hold faculty positions at the University of Pittsburg, Simon Fraser University, and Kwandong University. They hold research positions at National Institutes of Health (NIH), MIT, and Duke, and have industrial positions at Novartis, Eli Lilly, and Abbott Pharmaceuticals. Funding from the lab has come primarily from NIH and National Science Foundation (NSF) over the years. Ross Dalbey will be taking graduate students in the Autumn of 2013. More detailed information can be found here. Chen, Y. and Dalbey, R. E. (2018) Oxa1 Superfamily: New Members Found in the ER. Trends Biochem. Sci. Jan 12. Spann, D., Pross, E., Chen, Y., Dalbey R. E., and Kuhn, A. (2018). Each Protomer of a Dimeric YidC Functions as a Single Membrane Insertase. Sci. Reports. Jan 12, 8:589. Chen, Y., Capponi, S., Zhu, L., Gellenbeck, P., Freites, J. A., White, S. H., and Dalbey, R.E. (2017). YidC insertase of Escherichia coli: Water Accessibility and Membrane Shaping. Structure, 25, 1403-1414. Dalbey, R. E., Pei, D. and Doğan Ekici, Ö (2017). “Signal Peptidase Enzymology and Substrate Specificity Profiling”, pages 35-57 in “Enzymology at the Membrane Interface: Interfacial Enzymology and Protein-Membrane Binding”, Vol 584, Methods in Enzymology, Academic Press. Kuhn, A. and Dalbey, R. E. (2016). “Protein Translocation: SecA-SecY Conformational Crosstalk Opens Channel”. Current Biology 26, R811. Rawat, S., Zhu, L., Lindner, E., Dalbey, R. E. and White, S. H. (2015). “SecA Drives Transmembrane Insertion of RodZ, a Novel Single-span Membrane Protein”. J. Mol. Biol., 427, 1023-1037. Dalbey, R. E. and Kuhn, A. (2015). “Membrane Insertases are Present in All Three Domains of Life”. Structure 23, 1559-1560. Hennon, S. W., Soman, R., Zhu, L. and and Dalbey, R. E. (2015). “YidC/Alb3/Oxa1 Family of Insertases”. J. Biol. Chem. 290, 14866-14874. Chen, Y., Soman, R., Shanmugam, SK, Kuhn, A. and Dalbey, RE (2014). “The Role of the Strictly Conserved Positively Charged Residue Differs among the Gram-positive, Gram-negative, and chloroplast YidC homologs”. J. Biol. Chem. 289, 35656-35667. Hennon, S. W. and Dalbey, R. E. (2014). “Flexibility and Proximity Relationships Between the Transmembrane Segments of the E. coli YidC”. Biochemistry, 53, 3278-3286. Dalbey, R. E. and Kuhn, A. (2014). “How YidC Inserts and Folds Proteins Across a Membrane”. Nat Struct. Mol. Biol. 21, 435-436. Soman, R., Yuan, J., Kuhn, A. and Dalbey, R. E. (2014). “Polarity and Charge of the Periplasmic Loop Determine the YidC and Sec Translocase Requiremets for the M13 Procoat Lep Protein”. J. Biol. Chem. 289, 1023-1032. Zhu, L., H. Ronald Kaback, and Dalbey, R. E. (2013) YidC- a Molecular Chaperone for LacY Protein Folding via the SecYEG machinery. J. Biol. Chem., 288, 28180-28194. Zhu, L., Wasey, A., White, S. H. and Dalbey, R. E. (2013) Charge-composition Features of a Model Single-span Membrane Proteins that Determine Selection of YidC and SecYEG Translocase Pathways in Escherichia coli. J. Biol. Chem., 288, 7704-7716.